This article is about the lake. For the pre-Columbian city-state, see Texcoco (altepetl). For the modern municipality and city, see Texcoco, State of Mexico. Between the Pleistocene epoch and the last glacial period, the lake occupied the entire Mexico Valley. Lake Texcoco reached its maximum extent 11,000 years ago with a size of about 2,189 square miles (5,670 km2) and over 500 feet (150 m) deep. When the lake's water level fell it created several paleo-lakes that would connect with each other from time to time. At the north in the modern community of San Miguel Tocuilla there is a great paleontological field, with a great amount of pleistocenic fauna. The Lake was primarily fed by snowmelt and rain runoff when the Mexico Valley had a temperate climate. Between 11,000 and 6,000 years ago, the climate naturally warmed and snowfall in central Mexico became less prevalent. This caused the water level of the lake to drop over the next several millennia. Remnants of the ancient shoreline that Lake Texcoco had from the last glacial period can be seen on some slopes of Mount Tlaloc as well as mountains west of Mexico City. The disarticulated remains of seven Columbian mammoths dated between 10,220 ± 75 and 12,615 ± 95 years (BP) were found, suggesting human presence. It is believed that the lake disappeared and re-formed at least 10 times in the last 30,000 years. Agriculture around the lake began about 7,000 years ago, with humans following the patterns of periodic inundations of the lake. Several villages appeared on the northeast side of the lake between 1700 and 1250 BC. By 1250 BC the identifying signs of the Tlatilco culture, including more complex settlements and a stratified social structure, are seen around the lake. By roughly 800 BC Cuicuilco had eclipsed the Tlatilco cultural centers and was the major power in the Valley of Mexico during the next 200 years when its famous conical pyramid was built. The Xitle volcano destroyed Cuicuilco around AD 30, a destruction that may have given rise to Teotihuacan. After the fall of Teotihuacan, AD 600–800, several other city states appeared around the lake, including Xoloc, Azcapotzalco, Tlacopan, Coyohuacan, Culhuacán, Chimalpa and Chimalhuacán – mainly from Toltec and Chichimeca influence. None of these predominated and they coexisted more or less in peace for several centuries. This time was described as a Golden age in Aztec chronicles. By the year 1300, however, the Tepanec from Azcapotzalco were beginning to dominate the area. According to a traditional story, the Mexica wandered in the deserts of modern Mexico for 100 years before they came to the thick forests of the place now called the Valley of Mexico. Tenochtitlan was founded on an islet in the western part of the lake in the year 1325. Around it, the Aztecs created a large artificial island using a system similar to the creation of chinampas. To overcome the problems of drinking water, the Aztecs built a system of dams to separate the salty waters of the lake from the rain water of the effluents. It also permitted them to control the level of the lake. The city also had an inner system of channels that helped to control the water. The Aztec ruler Ahuitzotl attempted to build an aqueduct that would take fresh water from the mainland to the lakes surrounding the Tenochtitlan city. The aqueduct failed, and the city suffered a major flood in 1502. During Cortés's siege of Tenochtitlan in 1521, the dams were destroyed, and never rebuilt, so flooding became a big problem for the new Mexico City built over Tenochtitlan. The Valley of Mexico is a basin with an average elevation of 2,236 m (7,336 ft) above mean sea level located in the southern highlands of Mexico's central altiplano. 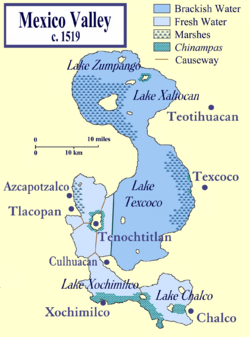 Lake Texcoco formerly extended over a large portion of the southern half of the basin, where it was the largest of an interconnected chain of five major and several smaller lakes (the other main lakes being Xaltocan, Zumpango, Chalco and Xochimilco lakes). During periods of high water levels—typically after the May-to-October rainy seasons—the lakes were often joined as one body of water, at an average elevation of 2,242 m (7,356 ft) above mean sea level. In the drier winter months the lake system tended to separate into individual bodies of water, a flow that was mitigated by the construction of dikes and causeways in the Late Postclassic period of Mesoamerican chronology. Lake Texcoco was the lowest-lying of all the lakes, and occupied the minimum elevation in the valley so that water ultimately drained towards it. The Valley of Mexico is a closed or endorheic basin. Because there is no outflow, evapotranspiration is estimated to be 72-79% of precipitation. Mexico City suffered from periodic floods; in 1604 the lake flooded the city, with an even more severe flood following in 1607. Under the direction of Enrico Martínez, a drain was built to control the level of the lake, but in 1629 another flood kept most of the city covered for five years. At that time, it was debated whether to relocate the city, but the Spanish authorities decided to keep the current location. Eventually the lake was drained by the channels and a tunnel to the Pánuco River, but even that could not stop floods, since by then most of the city was under the water table. The flooding could not be completely controlled until the twentieth century. In 1967, construction of the Drenaje Profundo ("Deep Drainage System"), a network of several hundred kilometers of tunnels, was done, at a depth between 30 and 250 m (98 and 820 ft). The central tunnel has a diameter of 6.5 m (21.3 ft) and carries rain water out of the basin. The ecological consequences of the draining were enormous. Parts of the valleys were turned semi-arid, and even today Mexico City suffers for lack of water. Due to overdrafting that is depleting the aquifer beneath the city, Mexico City is estimated to have dropped 10 meters in the last century. Furthermore, because soft lake sediments underlie most of Mexico City, the city has proven vulnerable to soil liquefaction during earthquakes, most notably in the 1985 earthquake when hundreds of buildings collapsed and thousands of lives were lost. The term "Texcoco Lake" now refers only to a big area surrounded by salt marshes 4 km (2.5 mi) east of Mexico City, which covers the ancient lake bed. Also there are small remnants of the lakes of Xochimilco, Chalco, and Zumpango. Several species indigenous to the lake are now extinct or endangered (e.g. axolotls). The modern Texcoco Lake has a high concentration of salts and its waters are evaporated for their processing. A Mexican company, "Sosa Texcoco S.A" has an 800-hectare (2,000-acre) solar evaporator known as El Caracol. Land reclamation of the lakebed was part of Mexico's attempts at development in the twentieth century. ^ Fuat Şentürk (1994). Hydraulics of Dams and Reservoirs. Water Resources Publication. p. 6. ISBN 978-0-918334-80-0. ^ Alonso de Zurita (1994). Life and Labor in Ancient Mexico: The Brief and Summary Relation of the Lords of New Spain. University of Oklahoma Press. pp. 304–. ISBN 978-0-8061-2679-1. ^ "Moctezuma: The leader who lost an empire". 2009-09-21. ^ Birkle, Peter (December 1998). "The water balance for the Basin of the Valley of Mexico and implications for future water consumption". Hydrogeology Journal (6). Retrieved 2016-10-03. ^ Sample, Ian. "Why is Mexico City sinking?". The Guardian. Retrieved 3 October 2016. ^ Moreno Murillo, Juan Manuel (1995). "The 1985 Mexico Earthquake". Geofisica Colombiana. Universidad Nacional de Colombia (3): 5–19. ISSN 0121-2974. ^ Matthew Vitz, "'The Land with which we struggle': Land Reclamation, Revolution, and Development in Mexico's Lake Texcoco Basin, 1910-1950". Hispanic American Historical Review 92, no. 1 (2012): 41-71. Agostini, Claudia (2003). Monuments of Progress: Modernization and Public Health in Mexico City, 1876–1910. Latin American and Caribbean series, no. 4. Calgary and Boulder: University of Calgary Press and University Press of Colorado. ISBN 978-1-55238-094-9. ISSN 1498-2366. OCLC 51495264. Aréchiga Córdoba, Ernesto (July–August 2004). "El desagüe del Valle de México, siglos XVI–XXI: Una historia paradójica" (PDF). Arqueología mexicana (in Spanish). 12 (68): 60–65. ISSN 0188-8218. OCLC 29789840. Archived from the original (PDF online reproduction) on 2008-05-15. Arroyo-Cabrales, Joaquín; Elaine Johnston; Luis Morett A. (2001). "Mammoth bone technology at Tocuila in the Basin of Mexico". In G. Cavarretta; P. Gioia; M. Mussi; M.R. Palombo (eds.). La Terra degli Elefanti: atti del 1o Congresso Internazionale = The World of Elephants: proceedings of the 1st International Congress. 1st International Congress "the World of Elephants", Rome, 16–20 October 2001. Rome: Consiglio Nazionale delle Ricerche. pp. 419–423. ISBN 88-8080-025-6. OCLC 50419738. Archived from the original (PDF online reproduction) on 6 June 2008. Berdan, Frances F.; Blanton, Richard E.; Boone, Elizabeth Hill; Hodge, Mary G.; Smith, Michael E.; Umberger, Emily (1996). Aztec Imperial Strategies. Washington, DC: Dumbarton Oaks Research Library and Collection. ISBN 978-0-88402-211-4. OCLC 27035231. Bradbury, John P. (March 1971). "Paleolimnology of Lake Texcoco, Mexico. Evidence from Diatoms" (PDF online reproduction). Limnology and Oceanography. 16 (2): 180–200. doi:10.4319/lo.1971.16.2.0180. ISSN 0024-3590. OCLC 1715910. Niederberger, Christine (1979-01-12). "Early Sedentary Economy in the Basin of Mexico". Science. 203 (4376): 131–142. doi:10.1126/science.203.4376.131. ISSN 0036-8075. OCLC 1644869. PMID 17834702. Rojas Rabiela, Teresa (July–August 2004). "Las cuencas lacustres del Altiplano Central" (PDF). Arqueología mexicana (in Spanish). 12 (68): 20–27. ISSN 0188-8218. OCLC 29789840. Archived from the original (PDF online reproduction) on 2008-05-11. Siebe, Claus; Peter Schaaf; Jaime Urrutia-Fucugauchi (October 1999). "Mammoth bones embedded in a late Pleistocene lahar from Popocatépetl volcano, near Tocuila, central México". Geological Society of America Bulletin. 111 (10): 1550–1562. doi:10.1130/0016-7606(1999)111<1550:MBEIAL>2.3.CO;2. ISSN 0016-7606. OCLC 94209925.